A new form of water has been discovered by physicists in Argonne's Intense Pulsed Neutron Source (IPNS) Division. Called nanotube water, these molecules contain two hydrogen atoms and one oxygen atom but do not turn into ice - even at temperatures near absolute zero. Instead, inside a single wall tube of carbon atoms less than 2 nanometers the water forms an icy, inner wall of water molecules with a chain of liquid-like water molecules flowing through the center. This occurs at 8 Kelvins, which is minus 445 Fahrenheit. As the temperature rises closer to room temperature, the nanotube water gradually becomes liquid. Image: New form of water in a nanotube. Water behaves differently when confined inside a long, narrow nanotube. The copper-colored exterior rings represent the carbon nanotube 1.4 nanometers across. The red and white interior cylinder is an icy wall with permanent hydrogen bonds shown in red; white represents oxygen. The interior chain is in constant motion. Yellow represents the hydrogen in the chain. Image by Christian J. Burnham, University of Houston. Researchers ranging from biologists to geologists and materials scientists are interested in water's behavior in tightly confined spaces controlled by hydrophobic - water repulsing - materials because this situation is found in nature, for example when tiny roots carry water to plants. Some membrane proteins also face this challenge, including aquaporin, which controls water flow through cell walls. This IPNS study is the first experiment with water in a nanotube. "I was surprised," said principal investigator Alexander Kolesnikov," that no one has tried testing water in nanotubes. There have been a large number of calculations, made even more difficult because water is so difficult to model, but no experimental work." "Even though people have been modeling water for decades," said visiting scientist Christian J. Burnham from the University of Houston, "we are only now just beginning to appreciate the importance of including the correct quantum-level description of the motion of the hydrogen nuclei and we are still working on a more accurate mathematical description of the charge clouds enveloping each water molecule." Researchers Kolesnikov, Chun Loong, Nicolas de Souza, Pappannan Thiyagarajan and Jean-Marc Zanotti used the IPNS for the experiments. Instruments at the IPNS study atomic arrangements and motions in liquids and solids. The IPNS is open to researchers from industry, academia and other national and international laboratories. 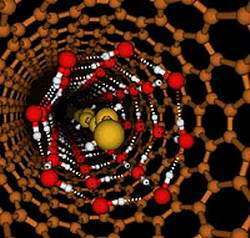 Research partners at MER Corp., Tucson, Ariz., supplied the nanotube samples made of nearly pure carbon only one atom thick. Each tube was 1.4 nanometers across and 10,000 nanometers long; imagine a piece of dry, hollow spaghetti 200 meters long because the nanotube is 100,000 times longer than wide. "With this one-dimensional confinement," Kolesnikov said, "we expected something new, but not the characteristics we observed. Something extraordinary appeared." What appeared was "totally different from bulk liquid or ice," said Kolesnikov. At 8 K, four-coordinated water molecules create an icy lining inside the naturally hydrophobic carbon nanotube. The lining free-floats inside the carbon nanotube with a 0.32 nanometer space all around it because that is as close as nature allows the water to the carbon. "An interior chain is running inside the lining, but compared to bulk water is much more mobile," Kolesnikov said. Researchers attribute the peculiarities to the low "coordination numbers" of the molecules. In liquid water, an average of 3.8 (the coordination number) hydrogen bonds connect the molecule to its closest neighbors. In ice, four hydrogen bonds connect to its closest neighbors. In nanotube water, the number of hydrogen bonds for the chain water molecules is only 1.86. "Because of the loose bonding, the water is very active and is always moving," Kolesnikov said. The icy lining is much more stable, but the mobile chain makes and breaks bonds continuously between parts of the chain and sometimes with the icy wall. To prepare for the experiment, the carbon nanotube sample was exposed to water vapor for several hours and dried to remove exterior water. Then researchers studied it with several neutron scattering techniques at the IPNS. Neutrons are uncharged particles found in nearly all matter. When the IPNS sends beams of neutrons through materials, they reveal a material's structural and dynamic properties. First, researchers used the Small Angle Neutron Diffractometer to determine that water filled only the interior of the nanotube. If water were on the exterior, it would have skewed the neutron-scattering results. Other neutron diffraction techniques provided the atomic arrangement, and inelastic and quasielastic neutron scattering measurements revealed the water's molecular motions. Next, Burnham, an expert in modeling the molecular dynamics of water, developed the simulation that shows how the new form of water behaves in the nanotube. The small scale of the materials was an advantage in creating the simulation, making it much faster in comparison to the simulation of, for instance, a biological structure thousands of times larger and more complex. Another advantage, according to Kolesnikov, is that scientists from other disciplines will be able to isolate water's behavior in this one-dimensional confinement. "In the inelastic neutron scattering experiment, the carbon is almost invisible compared to the hydrogen atoms, so you only see the water. Biologists can use our information to understand how the water behaves in their much larger, complex models," Kolesnikov said. Funding for this research was supplied by the U.S. Department of Energy's Office of Basic Energy Sciences. Research continues. Burnham will expand his classical molecular dynamics research to include quantum effects using parallel computing with funding from Argonne's Theory Institute. IPNS researchers plan to look at water in nanotubes with smaller diameters close in size to membrane proteins that selectively transport water. They also want to study the thermodynamic properties of nanotube water. Kolesnikov said he has studyied water on and off during his career "because it is so critical to everyday life - here on Earth and in the planetary system." This research was published in Physical Review Letters, July 16, 2004.